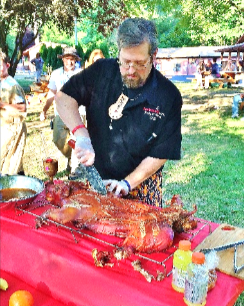 Cochon De Lait is a French term that translates literally to "Pig in Milk." Traditionally, this most Cajun of dishes uses a suckling (less than six-week old) pig. The fine folk of southwest Louisiana love their pork, but Cochon De Lait is spoken of with a special kind of reverence. It’s also a great excuse to throw a party, play some music, and hang out with friends and family! We’re going to use a bit bigger pig, which won’t quite match the subtle flavor and texture of a sucking, but rubbed with white wine and classic Cajun seasons, is still well North of sublime. Cajuns will often tell you that the cracklins (the Southern equivalent of Latino Chicharrones) from the cooked skin of the pig is the best bite at the party, and they’re crazy easy to make! Score and oil the pig on all sides. By scoring before roasting, as opposed to the more traditional La Caja China method, more of the fat is released from the skin, making it easier to make your cracklins later. Combine salts, paprika, garlic powder, cayenne, and pepper. Rub into pig on all sides until well coated, marinate overnight. In a medium bowl, combine wine, butter, and hot sauce. Baste your pig prior to roasting, after flipping, and after removing the skin. The day you plan to cook, remove the pig from the cooler and let it warm up to room temperature. Place 3-4 (depending on size) disposable drip pans in the bottom of the box, and add a couple of cups of water, apple juice, or beer to each pan. under the rail of the top frame. small piece of foil to protect the bottom from moisture, removing both end rails for ventilation. Close up the box with the ash pan, and charcoal grid, to cover. Cover box with the ash pan and charcoal grid. Add 14 lbs. of charcoal for a 70# box or 16lbs of charcoal a 100# box, in two equal piles and light. Once lit (20-25 minutes) spread the charcoal evenly over the charcoal grid. (7-8 hours) keeping the box temp between 225F and 250F. IMPORTANT: DON’T PEEK! Only lift the charcoal lid as instructed. Once you reach 195 F on your thermometer, open the box and remove the smoker. Flip the pig, skin-side up, and baste. Cover the box again with the ash pan and the charcoal grid; do not add more charcoal at this time. In Part Two, we’ll take a look at how to make those lip-smackin’ cracklins, as well as a couple of traditional side dishes to turn your Cochon De Lait into a rajun’ Cajun Pig Party!